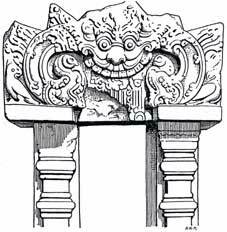 A gateway in the Sivaite temple of Prambanan in Java (ninth century A.D.), to show the transformation of the Winged Disc on the lintel. The wings are conventionalized into geometrical patterns, in the centre of each of which the serpent (with an atrophied lower jaw) is shown performing a somersault, the effects of which are seen in the American designs. Note the absence of the lower jaw in the Kalimakara head.